Voters in Swaziland are choosing a new parliament, even though political parties cannot take part and the king retains absolute power. Candidates are hand-picked by traditional chiefs who are loyal to King Mswati III. Banned opposition groups, mainly based in South Africa, have called for a boycott. 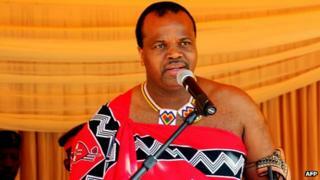 King Mswati recently described his country's electoral system as a "monarchical democracy". He is Africa's last absolute monarch, with the powers to rule by decree and dissolve the 55-member parliament whenever he wants. He recently announced that he would be taking his 15th wife, an 18-year old beauty queen whom he spotted at the annual reed dance. Political parties were officially banned in Swaziland in the 1970s - a restriction yet to be overturned, although they are now allowed to register. The European Union and Southern African groups have sent observers to the polls. While King Mswati's family has ruled Swaziland since the 1800s there has been growing criticism of his large family's lavish lifestyle at a time when many in the country live below the poverty line.